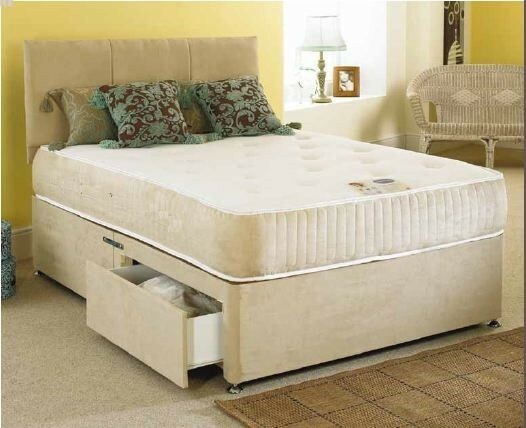 The Revive 5ft King Size 1500 Pocket Sprung Memory Foam Zip & Link Bed in Stone Faux Suede comes with two luxury mattresses. Each Mattress is constructed around 1500 count pocket spring unit, ( in a 5ft King size Mattress), with ultra-supportive layers of 50mm high density visco elastic Memory foam sleep surface to distribute pressure and to provide ultimate comfort and support. Mattress side panels and Base are upholstered in a luxury Stone Faux Suede fabric. The Revive 5ft King size zip and link bed is 5ft wide and is available in following two Lengths. The Revive is available with a Platform top Base for firmer support or a Sprung Base for a softer more luxurious feel. The divan base is made from solid timber to provide a comfortable, sturdy, sleeping platform.The divan base comes with easy glide castors. Base comes in 2 section with castors and attachments for the headboard.